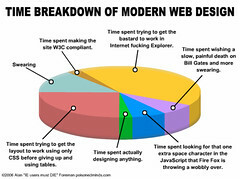 Finally someone has put the life of a web designer in complete perspective. If you're not familiar with web design, then study this chart carefully. You will soon understand it's meaning. Uploaded by nybon on 23 Jun 06, 1.40AM PST.